To state the obvious: Modern, smartphone-toting humans spend most of their time indoors. But indoor spaces often block cell signals and also make it nearly impossible to locate devices via GPS. Beacons are a solution. Beacons are a low-cost piece of hardware - small enough to attach to a wall or countertop- that utilize battery-friendly Bluetooth connections to transmit messages or prompts directly to a smartphone or tablet. They are poised to transform how retailers, event organizers, transit systems, enterprises, and educational institutions communicate with people indoors. Consumers might even want to deploy them as part of home automation systems. In a new report from BI Intelligence, we explain what beacons are, how they work, and how Apple - with its iBeacon implementation - is championing this new paradigm for indoor mobile communication. We also take a look at the barriers in the way of widespread adoption. In-store retail and offline payments are in the first wave of beacon applications. Retail outlets are adopting beacons to provide customers with product information, flash sales or deals, and to speed up the checkout process with a completely contactless payments system. Consumers seem receptive to beacons as a way to enhance their in-store shopping experience. 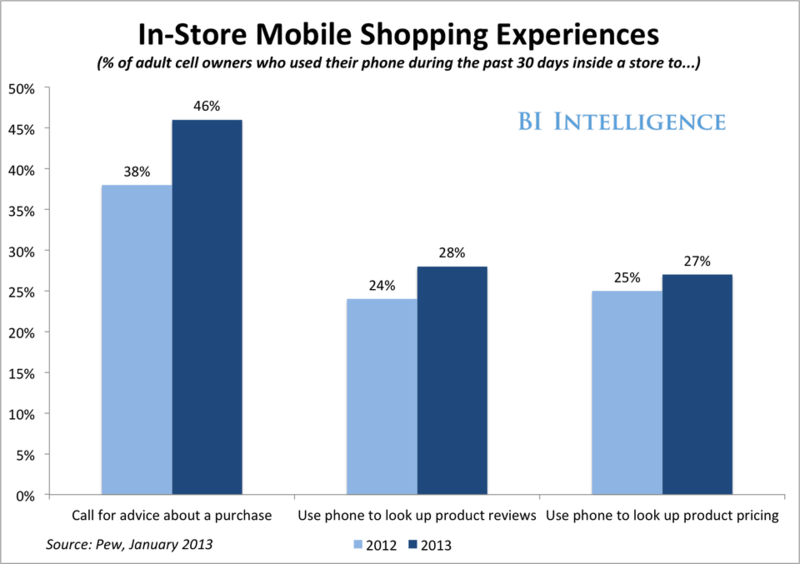 Half of American adults already utilize their mobile devices in stores. But there's a barrier to wide adoption of beacon technology: several layers of permissions. Customers have to turn on Bluetooth, accept location services on the relevant app and opt-in to receive in-store or indoor notifications. People are confused about Apple iBeacon because it has yet to take a true physical form. Apple hasn't manufactured a physical beacon. Instead, Apple's iBeacon is built into its devices and iOS7 mobile operating system. Already, 200 million iOS devices can already serve as transmitters and receivers. But third-party manufacturers have built beacons that can send iBeacon messages to Apple devices. The beacon wars are heating up. PayPal and Qualcomm are gearing up to challenge Apple with beacon hardware of their own. Smaller vendors like Estimote, Swirl, and GPShopper are entering the mix with beacon management and consulting on top of hardware or software platforms. The applications go beyond retail: We expect beacons to be deployed all over airports and ground transit hubs so that notifications on departures, delays, and gate and platform assignments can be delivered instantly to passenger phones. The report has charts and data that can be easily downloaded and put to use. Makes the case that beacons will take off once a handful of major retailers roll them out. Includes the points-of-view of executives at several start-up beacon-focused firms. Dives into the data on consumer attitudes toward location-based notifications, and whether beacon-powered alerts will be welcomed or resisted. Lists many of the possible applications for beacons, and how some large retailers and organizations have already tried them. Explains why beacons powered by Bluetooth low energy is much more effective than Wi-Fi or GPS for powering notifications indoors. Breaks down Apple's innovative strategy of making all of its devices potential receivers and transmitters in any implementation. For full access to the report on Beacons sign up for a free trial subscription today. 6Submit Your Nominations For The 2014 Silicon Valley 100!